Easter is coming up very quickly and we want to get you the delectable morsels that give you the tasty morsels over and over again. Imagine the joy of someone you love finding these in their Easter baskets? Hope your ready because here we go! Makes about 15 eggs depending on the size you make them. My eggs were just a little smaller than non-homemade creme eggs. 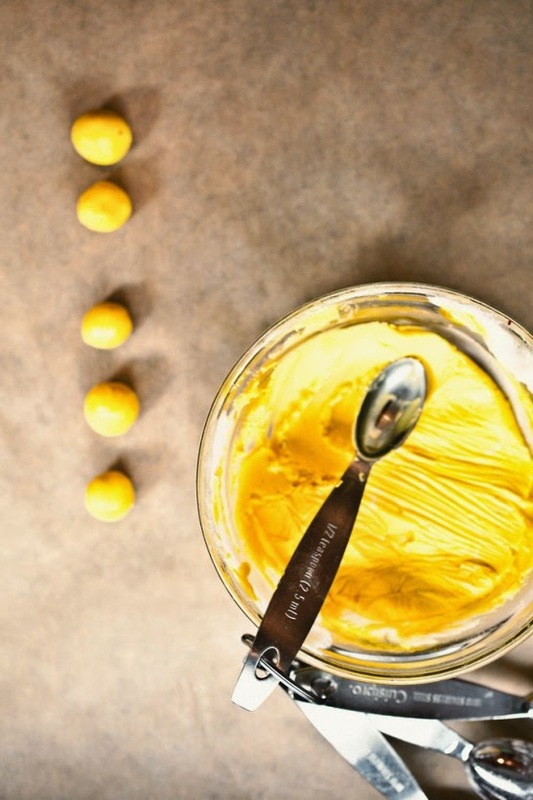 Place the butter in the bowl of a stand mixer that has been fitted with the paddle attachment (this can easily be done by hand or with a hand mixer). Add the Golden Syrup, salt, and vanilla. Mix on medium-low to combine. Scrape down the sides of the bowl with a rubber spatula to make sure everything is mixed well. Place ⅓ of the mixture into a small bowl and add enough food color to obtain desired color. Cover both bowls with plastic wrap and put into the freezer for at least 15 minutes. It is necessary that this mixture be very cold while working with it. When the sugar mixture has completely chilled remove from the freezer. Working quickly take about ½ teaspoon of the “yolk” mixture and roll it into a ball. Continue forming your yolks. Once the yolks are complete place them on a plate or a sheet tray covered with parchment and then put that back into the freezer. 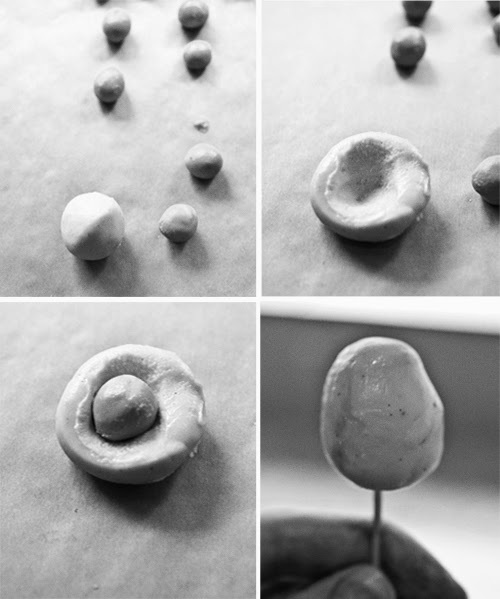 Now working with your “whites” use a tablespoon measure to scoop out the sugar mixture then roll that into a ball. Continue until all the white portion of the sugar mixture is gone. If the “whites” are too soft place back into the freezer for a few minutes. Remove the “yolks” from the freezer. Place a “white” in the palm of your hand and gently flatten a bit. Create a indent in the center to rest the “yolk” in. Place the “yolk” in the center of the “white” then cover it up. Roll the “white” into an egg shape. If at any point the sugar mixture gets too soft quickly put it back into the freezer. Continue this process until all your eggs are complete. Return to the freezer. While your eggs are chilling temper your chocolate. Or melt the chocolate in a microwave at 30 second intervals stirring very well in between. Add 1 tablespoon canola oil to the chocolate and stir well. This gives you a little more flexibility with the chocolate eliminating some of the need for precise tempering. You will not, however get as nice of a crack as you bite into the egg. Working with one egg at a time, remove the egg from the freezer and stick a toothpick in it. Dip the egg into the chocolate and carefully let the excess chocolate drip off. 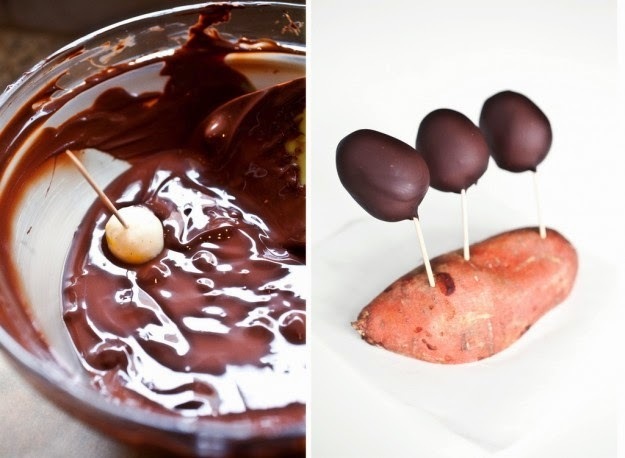 Place the toothpick into something – like a yam perhaps – while the chocolate sets. Place the chocolate covered egg into the fridge for 10 minutes while the chocolate sets. 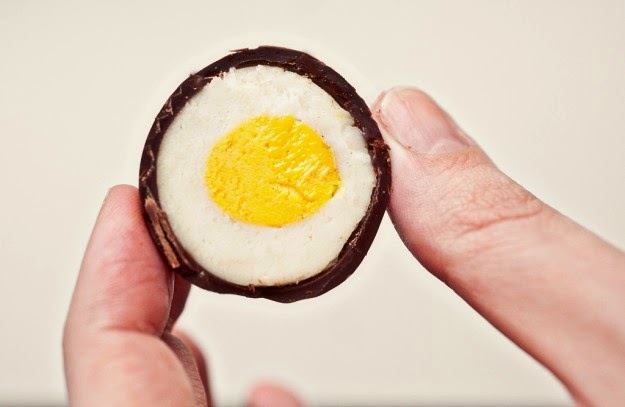 Carefully remove the toothpick from the egg and cover up the small hole with a little bit of tempered chocolate. And there you have it, you have the cadbury eggs with your own personal, loving touch! All the Ingredients can be ordered straight from Sweet Treat Supply. Get your order in as soon as you can!